I've volunteered to help out with the Hadoop User Group UK. Basically this means helping to organise our monthly talks and presentations. I was at a StartUp event last night: "Co-founders Wanted! Find or Become a London Co-founder". This was a networking event organised by Bizoogo - a new name to me. All in all I quite enjoyed it. I volunteered my services to someone who is starting a project connected to processing financial information: she wanted people skilled in BigData and Text Analytics. I also told another Entrepreneur to contact one of my recent clients involved in the fashion research industry. Basically he takes you through registering your application with LinkedIn, using a simple python script to access the REST api, saving data in simple CYPHER format and viewing it in Neo4J. We were asked recently to process a lot of word documents to extract information from them. This article talks about some of the tools we are using. Well, I said I would review this book but I have been putting it off. I just don't think I can do it justice. I did not really like this book but I can't properly say what is wrong with it. "Instant MapReduce Patterns – Hadoop Essentials How-to"
Now when I see "MapReduce Patterns" I was really expecting design patterns. Logical algorithms for how to do various tasks with MapReduce algorithms. I was expecting something like the Gang Of Four book on Design Patterns. That isn't what this book is. So I recently had need to package up a Spring Roo Java application so that it could be run by someone else remotely. 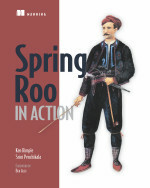 Now most SpringRoo apps I know are web apps - deployed as WAR files to a web server like Tomcat. But I was asked to make sure it ran from the command line. The main problem I had was that all my third party jar files are stored in my local Maven repository. Well, I hope to make it to the Hadoop User Group UK meeting in London tomorrow - but I am suffering from a cold. I hope to see you there, but am not sure whether I will be well enough. Booo. As usual. I intend to be at the Hadoop User Group UK meeting in London next week. Here is the original announcement from Dan Harvey. sparked quite a bit of discussion. - Dan Harvey will start with a talk on the "State of the Hadoop ecosystem"
It will be interesting to compare this to the Spring Roo cookbook which I reviewed earlier this year.